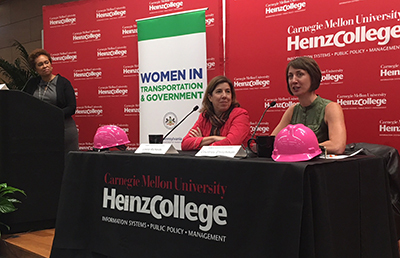 Secretary of the Pennsylvania Department of Transportation, Leslie S. Richards, and Traffic21 and Mobility21’s Courtney Ehrlichman joined Heinz students for the Women in Transportation & Government panel discussion. Both women shared personal stories on how they found themselves in leadership roles in transportation, and the barriers they overcame. The discussion was moderated by Melanie Harrington, President and CEO of Vibrant Pittsburgh.